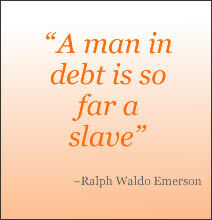 Take our powerful total debt elimination software for a test drive today! See how fast you can pay off debt. Our free demo account lets you check it out before setting up your own account or putting any money on the table. Our total debt elimination system is very easy to use. Simply enter your debts and our powerful software will create a customized debt payoff schedule for you. 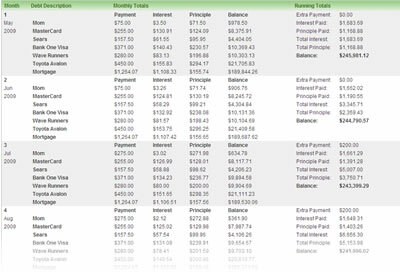 Look at the results and see how fast you can pay off debt! Below is the debts listing screen showing some sample debts we entered. Notice that the debts are automatically ordered from highest rate to lowest. Except for the first debt. Even though it is the lowest rate, it is scheduled to be paid first. This is because it is a small debt. Paying it off quickly will give you some fast positive results. After you enter your debts, you can view the results. The summary screen gives you detailed information as to how much money and time you will save by accelerating your debt payoff with our system. In our sample, we see a monetary savings of $181,103. We also achieve a time savings of 19 years and 7 months. Think about it. In less than 10 and a half years, this sample client could pay off all his debt. Next, we suggest you view you debt-payoff schedule. The reports are located under the reports tab. We will only show the first report here. It tells you exactly what to pay each month on each of your debts. It also gives you additional information such as how much interest you are paying on each debt and the amount of the extra payment each month, if you have added an extra payment. Payment 3 - We add an ongoing $200 additional payment, which will get applied monthly through payment 34. This is because on payment 35 we change our ongoing monthly payment to $450 instead of $200. Payments 10 and 22 - We add a one time payment for each of these periods. The one time payment isn't added to the ongoing payment. Instead, one-time payments replace ongoing payments. So in these two periods, our extra payments are $500 and $580. Payment 35 - We add a new ongoing monthly payment of $450 that replaces the prior $200 payment. You would probably do this if you got a raise at work. Payment 50 - We add a one-time payment of $0. This effectively eliminates any additional payments for that period. You might want to do this if you are short of money during a month. Take Christmas or your anniversary for example. Payment 72 - We zero out our ongoing monthly payment. This could happen if money gets tight and you are no longer able to make an extra payment. In addition to flexibility with extra payments, we also offer you the same flexibility with your interest rates. This allows you to modify any interest rate mid-way through your payment schedule. With our system, variable interest rates are not a problem. 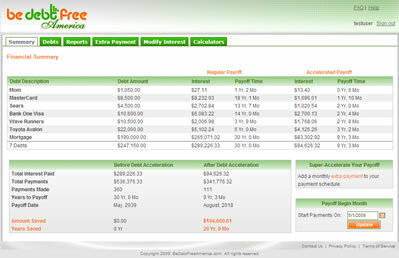 Would you like to check out our debt elimination software before purchasing it? We've created a Guest account just for you. You will be able to preview our entire application. The Guest account does not have access to add or change any data. If you decide to join, you will have full access to all our software's functionality. Take a test drive now! Copyright 2009-2015. BeDebtFreeAmerica.com. All rights reserved.